We are off to Peru for our 9th trip. 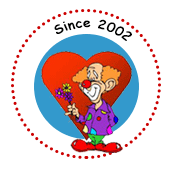 Most have been supporting Komedyplast – the nonprofit of marvelous craniofacial surgeons and staff. One trip, two months after the 8.0 earthquake several years ago, was at the “demand” of our Peruvian family to come and cheer up those affected in the small towns of Pisco and Chincha – which were desimated by the quake 35 miles off the coast of Pisco. For Banjo, Pelukyta and I, this upcoming trip is a retun “home” to many we know and have come to call family. For Alfredo, it will be a new and exciting experience. Stay in touch with us through the blogs Alfredo will be sending! Yes my first trip As a clown, although let me be clear, I have been overseas before and while I didn’t know it I was a clown. Really looking forward ot making kids smile, okay adults too.